As we get closer to the launch of our new entrée V4 SQL software, I wanted to share with you some important information to help you develop your company's implementation plan. This is especially important for you now, especially if your company plans on being one of our "early adapters". "Early adapters" are scheduled to receive their V4 SQL software in early July, and those that pre-ordered the software, will have the priority over those who have not. If you plan on being an "early adapter", please contact your NECS tech support representive, so we are sure to schedule the time you'll need to get your software up and running. I want to mention first that NECS recommends that you do not completely switch your operation to the V4 SQL software once it is installed on your server. 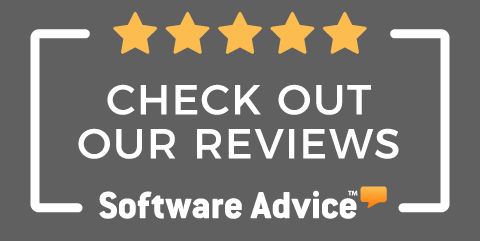 Instead, keep your existing entrée version 3 software running, and put V4 SQL through the paces doing things such as printing invoices or any other custom features we have provided for you over the years. We have taken great care to ensure past modifications were moved to the new software properly, but it is possible we may have missed something for your company. For example, is the new 7-digit Invoice Numbers fitting properly on your Invoice and Statement forms? Also, this will provide you with some time to start using the new "ribbon menu", search screens, report scheduler, dashboards, and the other new features of V4 SQL, so you and your staff are comfortable when you do decide to make the switch. It will also provide you some time to understand the learning curve of how the SQL files work related to running the new Update Utility, making backups, etc. There are three steps you need to understand and accomplish to implement V4 SQL. They are 1) Installation of the software, 2) Running the "Update Utility" and finally 3) Running the "Transfer Utility". The following explains each of these three steps. 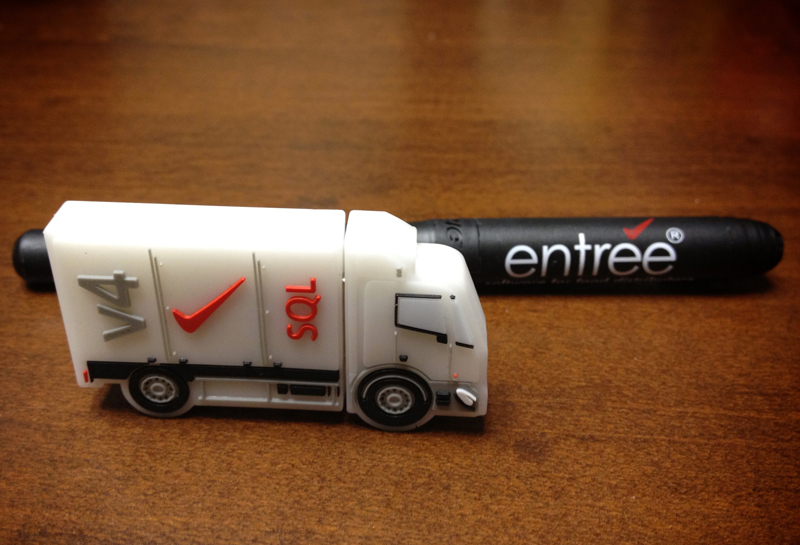 When you receive your V4 SQL software, it will be delivered on a 1 GB, USB drive, as pictured below. Cute, huh? I wanted to provide the software on a more creative medium than a CD. 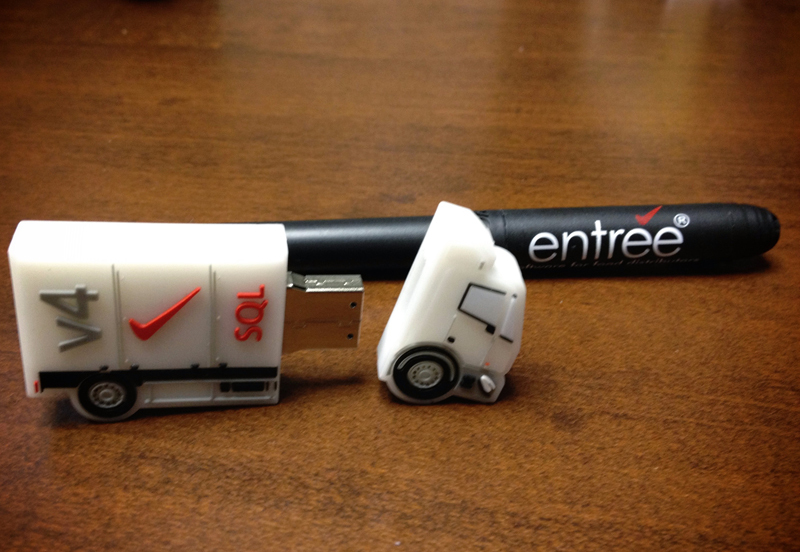 To show this is a USB drive, here is a shot with it open. Just pop off the cab part of the truck. You will insert the USB drive into your server, and then the installation wizard will launch. This will install both your V4 SQL software to your server, along with the Sybase Advantage SQL server software and all other necessary files. I want to note that all your subsequent V4 SQL software updates will ONLY be available via download off our web site. Most updates will only take a few moments or less to download. We still have a handful of customers that either don't have Internet access or always request we burn the updates for them onto a CD and ship to their location. Going forward, we will no longer provide that option. I also should note that you will also need to run the "Workstation Installer", so that the client software is installed on each workstation. This will place a new V4 icon on your users desktop. They will be able to select either the V3 / V4 icon to launch the approriate version. Once you are finished with testing and ready to make the switchover to V4 SQL, simply remove the V3 icon from your users desktop. The workstation installation can be accomplished at this point, as long as you don't actually try to run the software, as you don't have your SQL data setup yet (see steps 2 and 3 below). It is normally recommended that the workstation installation be done last, when the data is ready so that everything is in place to launch the application successfully. I just wanted to mention here, as this falls into the category of an installation step. Once your entrée V4 SQL and Sybase Advantage software are installed, the next step is for you to run the entrée "Update Utility". You MUST run the Update Utility on your server. 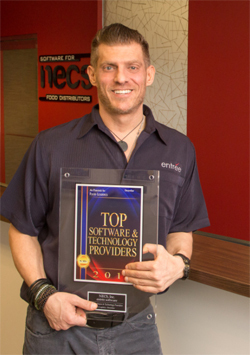 This is a requirement of using the Sybase Advantage SQL software, as well as any other type of SQL software. As most of you are aware, the Update Utility ensures that your data files have the latest data fields as required by the current entrée software installed. 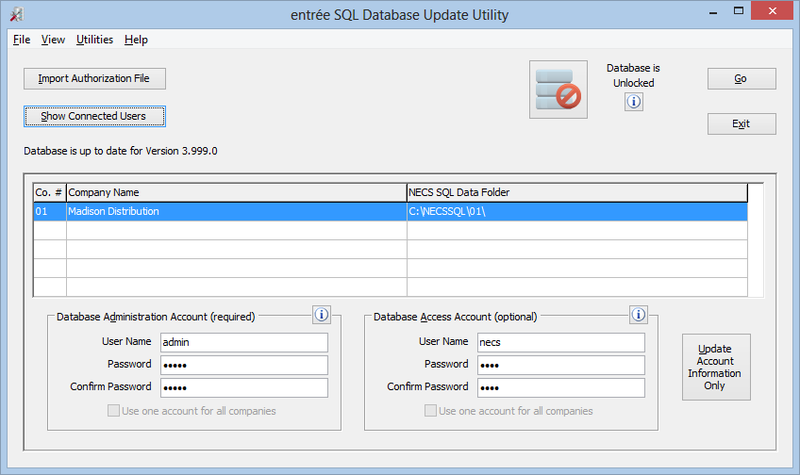 The first time you run the new Update Utility, it will create empty Sybase Advantage SQL data files for entrée. The default directory for these files is \NECSSQL. Note that all the file names remain almost 100% the same name, except they will now have an extension of "ADT" instead of "DBF". ADT = Advantage Database Table. Also, there will still be Index files (yes, Index files are still used with SQL data files, except you will rarely if ever need to "re-index" again). The Index files have an extension of "ADI" instead of of "CDX". ADI = Advantage Database Index. 1. 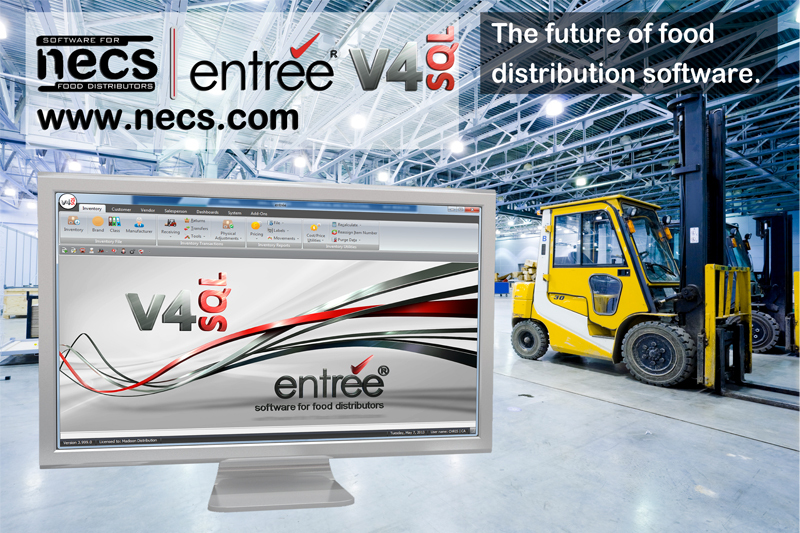 Updates your data files as required by the latest entrée version. This is the main function of the Update Utility, with an improved feature of allowing you to see which of your users are still logged in. Running this utility requires that users exit entrée, so that the SQL databases can be "locked" for the update. I briefly explain the other features next, but this first one is all that's necessary to begin using V4 SQL. As mentioned previously, the first time you run the update process, it will go very quickly, as only empty SQL databases are built. 2. Backup of your SQL files. This feature isn't actually a "backup" feature, but instead copies your SQL files from their protected directory, into a location which your backup software can access. It will create a "Windows Task Scheduler" event (which you can edit) to automate the copying of the files. Note that files can be copied for backup at any time (or multiple times) throughout the day, and it will not interfere or slow down entrée. And yes, files can be copied into a "Dropbox" or other Internet based backup tool for offsite storage. This feature can also be used to backup/copy an individual file or group of files whenever necessary. 3. Restore of your SQL files. When the time comes to take a file or your entire fileset to restore and replace your entrée SQL file(s), this is the feature to be used. 4. Reindexing of your SQL files. For those rare occasions when you need to Reindex a specific file or group of files, you will only be able to perform that function here. The "Reindex Files" feature is no longer available or needed from within your main entrée software. The final step is for you to run the entrée "Transfer Utility". The Transfer Utility will take your existing entrée version 3 software data, and populate it into the empty Sybase Advantage SQL data tables that the Update Utility created. 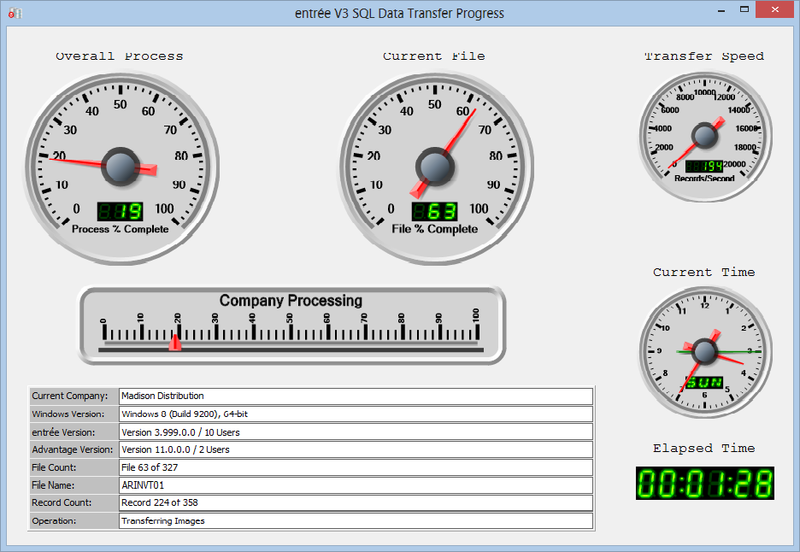 When the Transfer Utility starts its transferring of data processes, the new progress screen will appear. We designed this screen to be informative and also a little fun, as you watch the instrument meters spin to show you the transfer progress. How long will the Transfer Utility take? This obviously depends on the amount of data you have and the speed of your server. With our in-house tests with some of our largest customers datasets, it took between 3-5 hours. Note that scanned documents from entree.DOC seem to take the longest. The Transfer Utility takes your current scanned documents, which exist as independent TIF files in version 3, and merge them into special SQL data tables into something known as "BLOB" data. To summarize the reasons why to save as BLOB data, it is to provide faster and more reliable storage of this important data as well as ensure they are always backed up, including the backup/restore features of the "Sybase Replication" server (which I will cover in more detail in a future Blog). Caution! Please be sure that your server has enough disk space to handle both your version 3 data as well as your V4 SQL data. Your V4 SQL data will take about the same amount of space as your version 3 data. If not enough hard drive space is available, the Transfer Utility will end abruptly with and out of space error message. I expect that most customers will run the Transfer Utility at least twice. Why? Because the first time gets you ready to start experimenting with entrée V4 SQL and run it through the paces, while you still run version 3. This will provide you whatever time is necessary to test V4 SQL and get your staff comfortable and ready to go. Once you are satisified that V4 SQL is ready for you, you will simply run the Transfer Utility again to move your latest version 3 data files into the Sybase Advantage SQL data files again. Once your data has been "transferred", you are ready to go to begin testing. Test, Get Comfortable then Go Live! Once you complete the above steps, you will have V4 SQL installed with your most recent version 3 data. Now is the time to run V4 SQL through the paces, do some testing of options such as printing invoices, and give your staff some time to get comfortable with the features of your new software. If you experience any issues, please contact your tech support representative as soon as possible. If necessary, we will provide a software update with the necessary corrections. Once you determine you are ready to go "live", you will simply need to run the Transfer Utility again. This will take all your current version 3 data and copy it over once again to your V4 SQL data files. If this process took you 3 hours previously, you can expect it to take 3 hours again. Following these steps will assure you have a successful V4 SQL launch!